Privydolls love a great pair of jeans, and whether it be your daily uniform or your weekend wear you appreciate the familiar fit of your favorite pair. Premium denim has taken over the past few years and we have all paid up to $300 on that 'it' pair. Those times are over with the line, UJ (www.Uniglo.com). UJ jeans just opened a store in SOHO in NY and brags its prices of their premium denim is $39.50! Cutting edge cuts, washes is what UJ claims and we believe it with the many styles including our favorite, Extreme Skinny. Try one of their pastel colors for spring! 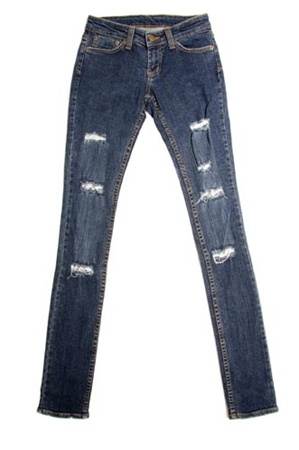 On the highest end for Spring/Summer denim has to be Acne Jeans. Their metal collection is made to order and can also protect you in a sword fight I would guess. The chain ling, and metal knee pads are custom and start around $2,000! We Also found Chanel apart of the Spring/Summer denim movement. These sunglasses have denim sides. So very cute! Denim is also being seen in purses and shoes and fanny packs from many of the biggest designers including Chanel, Louis Vuitton and many more. You can acheive this summer trend very easily. Many brands and stores are also catering to the denim lover. Just remember pastel denim and light colored, bleached is in. Miss Sixty has always been one of my favorite go to denim brands and of course their S/S line incorporates all we love in denim with their edgy, 80's flair. Acid wash, tapered and zippers are included on most of the collection. My favorite is below! Guess has always been a leader in denim and this season the denim vest is back. Buy a denim vest that is versatile and looks great dressed up or down. I found this one on www.Guess.com. For the Doll on a budget, Forever 21 has an entire Jean Shop. Click HERE to see all the denim under $25!!! Deal of the day is found on Sheikshoes.com. Stone washed denim heels also seen in People Magazine. Seen below for $29! !